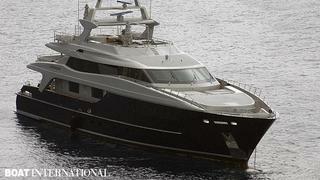 Anne Dixon at Camper & Nicholsons sends news that Fernando Nicholson has signed the 42.75m motor yacht Sofia 3 for sale. Designed by Francesco Paszkowski and built by Baglietto to ABS class, she was delivered in 2008. Accommodation is for up to 12 guests in a main deck master suite, two VIP staterooms and two twin cabins. Twin 1951hp Caterpillar engines give Sofia 3 a cruising speed of 13 knots and a range of 3,400 nautical miles. Lying in the South of France, Sofia 3 is asking €17,750,000.